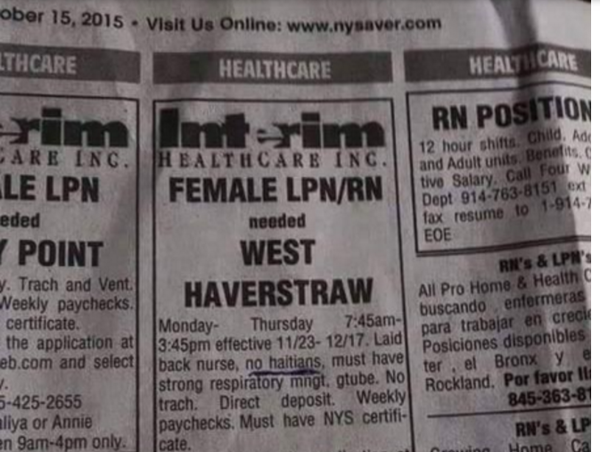 Interim Healthcare Ad in New York specifies "no Haitians." A Florida-based medical staffing company must pay a fine of more than $100,000 for posting an ad in New York that specified “no Haitians ” should apply. Interim Healthcare, which has its corporate office in Sunrise, offers healthcare services across the country through 300 different franchises. The ad appeared in a local Pennysaver in Rockland County, New York. New York Attorney General Eric Schneidman investigated the ad posting and found the discriminatory language was a violation of civil rights laws. According to the New York Daily News, the ad’s language was pulled directly from a patient’s request. When it was posted in September, the ad prompted public outcry on social media and drew the attention of elected officials and nurses associations in Florida, Boston and New York. The New York investigation found the Florida healthcare company did not have any protocols in place to weed out patients’ discriminatory requests before publishing them in ads.